I was giving the house a bit of a spruce up, as I am want to do on a Sunday morning, vacuuming away and humming along merrily, when a quick flick of the vaccuum cleaner cord brought my world crashing down on me…literally. 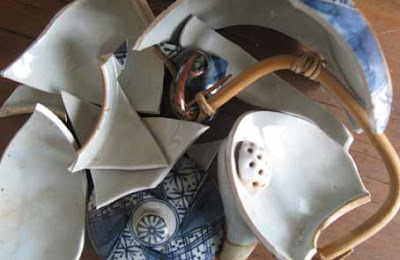 It was like one of those slow motion shots in a movie as, realising the cord had somehow flicked up onto the bench and knocked my all-time favourite teapot off, I threw myself across the room to try and save it. I sailed through the air - it was one of those super human moves people do in times of emergency, desperation and stress - and did manage to grasp the bottom of it, but alas, not in time to save it from smashing into a million (well ok,about 9) pieces on the floor. Oh I really feel for you, I know that feeling too. 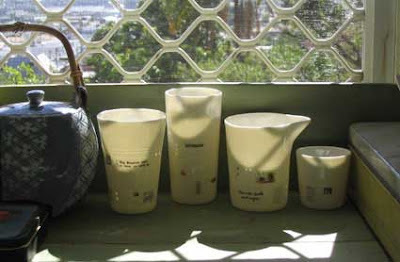 that was a totally normal ceramicist reaction. i would have done the same. including the disregarding life and limb bit to save it. I'm sorry to hear about your mishap with the beloved teapot. Maybe it can be super-glued back together again? aaaw thanks everyone! I'm coming to terms with it now...! And Miss Dot, that is SO sweet of you, but I think I'm going to glue it back together...it might not be functional again, but it'll make for a good story! Just a bit more history added to it! Could you not go mad and get a ceramic restorer to mend it for you. Might be pricey, tho'. Or you could mend it with rivets and make a feature of it, altho unusable. It's always a bummer when something like that happens. My experience is: it's always the pieces I like most that crash or...disappear.